(Varna) Mid-County High School "Bulldogs"
Lacon (population 1,979) is located along the banks of the Illinois River at the intersection of Il. Route 17 and Il. Route 29. This places Lacon in the middle of Marshall County about 25 miles north and a little east of Peoria. The Lacon/Marshall County Airport is located on the southeast side of town. Varna (population 436) is located at the intersection of Il. Route 89 and Il. Route 17. This places Varna in the center of Marshall County. A city of reference would be Metamora located 20 miles southwest of Varna. Both of these north-central Illinois towns originally supported their own high schools and both currently have pages on this site. The late 1940's saw the towns of Varna and Lacon began talks of consolidation for their school districts. The year was 1949 when this effort was realized. The result was the creation of the Mid-County School District. "I was a 1973 graduate of Mid-County. The last year for the Varna building was 1973. My brother Timothy, who is one year younger and graduated one year behind me, was in the first class which graduated from the new facility on Route 17." The new building opened up about four or five miles west of Varna on Illinois 17, and still stands today. 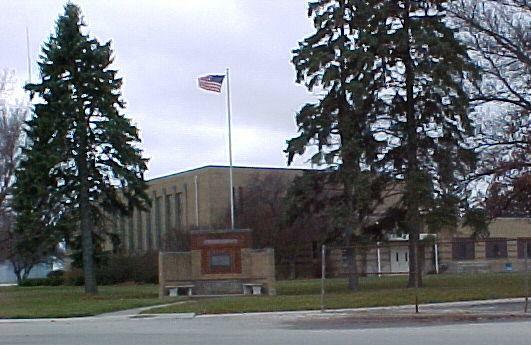 Mid-County welcomed their neighbor to the west, Sparland, in 1995 to join them to form Midland High School. 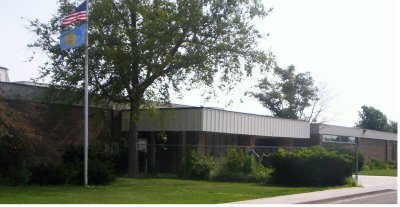 The high school for the Midland DIstrict uses the 1973 building. 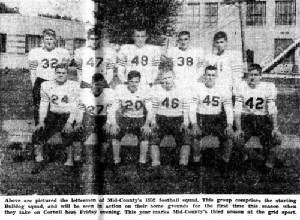 Mid-County HS team nickname: the "Bulldogs"
The Mid-County High School Bulldogs competed hard, year-in and year-out. The boys were offered baseball, basketball, cross country, football, and track. The Lady Bulldogs were offered basketball, track, volleyball, and softball (www.ihsa.org). It is possible that other sports were offered. Team records and coaches' names are needed. The boys baseball team of Mid-County High won two Regional titles. The hardwood court men of Mid-County High School won a total of SEVEN Regional Championships, and five Tri-County Conference Tournament titles. Legendary Coach Roger Beals made a brief stop in Mid-County as well. The Bulldog boys' basketball team won five Tri-County Conference tournaments (1952-80-89-92-94). Coach Ralph Hallam was a legendary skipper for the Bulldogs during the 1970's and '80's as his win-loss record would show, and was a colorful character off the court by the quotes he gave to the media in post-game interviews, too. 1993-94 Team Qualified for the IHSA State Meet!! We do not know the exact years, but as the photo to the right attests, football was offered to the boys of Mid-County at least in the mid-1950's. If you have any records or coach's names please forward them so we can share them on this page. 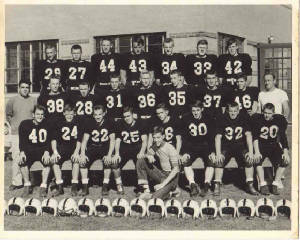 Thank you to Rolf Sivertsen for sharing the the photo of the 1955 Bulldog football team. The photo below depicts the boys from the fall of 1952. It states that this was the third season of football for the school. Thank you to Mark & Terri Taylor of TnT Images for sharing this with us. Click on either photo to view an enlarged version. "My dad is #35 in the photo, “Chuck” Charles Austin, son of Bill and Lilian Austin. The Lady Bulldog linksters had some great success in the early 1990's. The girls won a total of three Regional titles and qualified for the IHSA Class A State Tournament on two occassions. Unfortunately, the coaches' names are not currently available. 1989-90 Team Finished TENTH in the IHSA Class A State Meet!! The Lady Bulldogs had a great run in softball as well. Five Regional titles and two Sectional titles were the hi-lites of the diamond-ladies seasons. Most of the team records and coach's names of these and other good Mid-County softball teams are not available. One male trackster earned the only medal in IHSA competition in the history of Mid-County High School. His excellent accomplishment is listed below. The Mid-County lady netters were not without their moments. A Regional title was earned in 1983! The Mid-County Bulldogs competed in boys golf as well. One linkster even earned a medal at the IHSA State Meet competition. Kris Hahn did this in 1988 by finishing in 14th Place!! 1988 Kris Hahn 14TH Place!! The Illinois Theatre Festival is the largest, non-competetive high school theatre festival in the world. It was organized in 1976 by teachers from the Chicago suburbs. This festival is still going strong as they perform at the University of Illinois (Champaign-Urbana) and Illinois State University every other January. Mid-County High school participated in this festival in 1984 and 1986. "One of our friends just e-mailed us this website. We enjoyed scrolling through it. My husband, Mike Orrison, was a teacher and a coach at the Mid-County High School/ Midland High School in Varna from 1969 - 2000 when he retired and we moved out here to Kernersville NC. We can add some information to "our" site. One of the statements was that the school song was "unknown". The tune was the same as the Ohio State fight song. We know the words if you want them. He also started the Girls' Golf Team in 1988 and continued coaching them until 2000 when he retired. I (Jeanne Orrison) became his assistant at that time as he was also the Boys' Golf Coach. Individual girls could play on the boys' team before 1988 and try to qualify in the girl's state tournament. Susan Orrison was one of these individuals who qualified for the sectionals in 1985. Mike coached many good golfers and had 22 straight years of coaching either a boy or a girl who qualified for sectionals either as a team or as an individual. Some went on to play in the State tournaments. Mike also coached girls' softball which you already have on the website. Here is some additional information... In 1988 the girl's team won BOTH the regional and sectional tournaments and advanced to the state tournament." I remember art class in 1982 sitting next to LaVonne Missel who went on to become "Miss Illinois" and was a top 10 finalist for "Miss America"! http://www.youtube.com/watch?v=O5hJVCjkpU0 .